NOT YOUR GRANDMA'S CONDO! Our 2BR/2BA condo is on the gulf side of Palm Bay Club, one of the most sought-after properties on Siesta Key. Step out of the condo and onto the palm tree-lined path leading directly to Crescent Beach, voted the #1 beach in the U.S. for it's fine white quartz sand that never burns your feet! Start your day with a stroll on the beach, picking up seashells. Relax the day away, pop back to the condo for lunch, maybe BBQ on the beach for dinner and stay for a breathtakingly beautiful sunset. Relax by one of two private, heated pools or in the large hot tub or sauna. Drop a line in the water from the fishing pier, play tennis on one of the lighted on-site courts or shoot a round at one of the many nearby golf courses. While the condo has a fully-equipped kitchen, Siesta Key also has countless choices for local dining, nightlife and shopping. We are the perfect vacation spot for retirees, families, weekend get-aways or honeymooners. Dan and I live in Minnesota (brrr!) We just became empty nesters and wanted to find a warm weather vacation home where our family could come together for visits in the years to come. We have different vacation styles: two of us like to 'do' - golf, fish, run, sports, etc. and the other two like to 'be' - read books, enjoy music, people watch, relax, etc. We've found the best of both on Siesta Key. We wanted a warm weather destination. Word-of-mouth and research for good beaches led us to this property. Being only 20 mins. from the Sarasota airport is a huge plus. After all, when you're on vacation you just want to get there! Sarasota itself is only 10 mins. away with it's marina, restaurants, shopping and cultural opportunities. And then, when we got onto Siesta Key, we just knew we'd found the perfect get-a-away. We love the little village of Siesta Key itself and the fact that it has only local eateries (no golden arches here). We were looking for a place where you walk in and think 'Wow, this place is really nice!' and that's how we felt when we walked through the door of our condo at Palm Bay Club. Wow! We like that we are 'close' to it all but not 'in the middle' of it all. A place big enough to have all the amenities but not so big that you feel you need to get up at 6:00 a.m. to reserve your chair by the pool or beach. Of course we enjoy the beach and lovely weather. We love Siesta Key and all the great food and shopping (it's got the best ice cream shoppe). We like the convenience of a small grocery within walking distance yet several larger just over the bridge. The on-site fitness center is nice too if you've eaten and relaxed a little too much. We haven't stayed when the turtles are nesting yet but we look forward to that. We have seen dolphins though which is an amazing site when you're from up north! Shared-on first floor of building,. Laundry products available for purchase in rec room bldg. Well-furnished condo close to town, great restaurants, shopping, and THE BEACH! Couldn't ask for a better stay! Our stay on Siesta Key was amazing! The weather and beach were beautiful. The condo we stayed in was very spacious for a family of four, clean and updated and the outside properties were well kept up. There were many nice restaurants and ice cream shops in the village area which were a short trolley ride away. Close walk to the beach, very clean, and sues response time was super quick. Prefect for our family vacay and we can't wait to come back!!! What a wonderful location, and great condo. It was the perfect location for a nice getaway. The condo was very clean, and had everything we needed. A short walk got us to beautiful Siesta Key. We had a minor issue (on our end), getting the entrance code and info. Sue was very quick, and accommodating, to help us as we arrived. We would book again in a heartbeat. Nice condo. Clean, full of all the amenities you need. Good location for the beach, Siesta Village. Comfortable beds and furniture. Not much of a view from the balcony, but who stays in the place that much. Thanks. We are located on the gulf-side of Siesta Key at the Palm Bay Club. 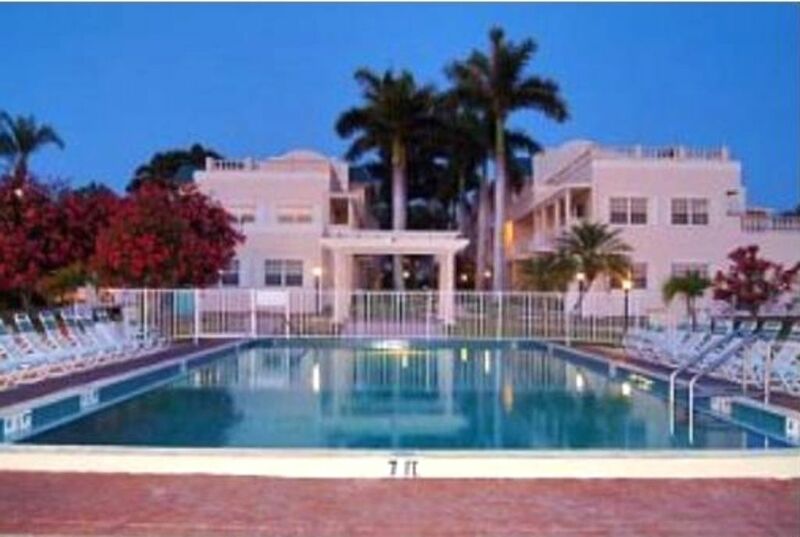 Our building is between the main pool/tennis courts and the beautiful white sands of Crescent Beach/Siesta Beach. Winter and Spring Break Weeks are full week, Saturday-Saturday rentals only. Full week rentals the rest of the year are discounted, enter your dates to see those rates.